Vietnam is my favorite country. Lots of people “backpack” through Vietnam this way without ever actually strapping on a backpack. 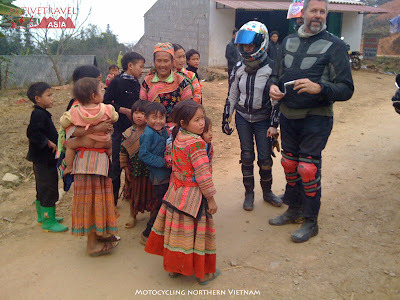 Of course, many people enjoy this style of travel and leave Vietnam satisfied, but if you would like to experience a more authentic, friendly and adventure, I suggest choose motorcycle tour through the mountains northern Vietnam. In the countryside of northern Vietnam the Minsk motorcycles rule the roads. I went to Sapa, Lao Cai, the beautiful French Hill station. Sapa is a popular destination and most backpackers on the train to northern Vietnam will be heading there. Not to be missed are some smaller mountain towns to the east of Sapa. One rainy morning I visited a hillside market located only four miles from the Chinese border. The Minsk can easily handle the rough terrain of northern Vietnam. I swiftly passed by the stuck Land Cruisers and found them still waiting on my return. After spending a few days in the eastern tribal region, I drove to Sapa, and a few days later continued west along the Dien Bien Phu loop road. The scenery on the trip is amazing. The town of Sapa sits perched on a dramatic mountain valley. A short drive from Sapa is Mt. Fansipan. With an elevation of 3143m, the peak of Mt. Fansipan was shrouded in the clouds as I drove over the pass. There are many colorful ethnic minorities living in the mountains along the loop road. In Sapa, the girls from the local ethnic minorities will offer to guide you on hikes to their villages. These girls speak English amazingly well, learned only by listening to the foreign tourists. I never went along on one of their hikes, but it was reported to me to be a great experience. You will encounter many other different ethnic minorities along the way, each with their own style of distinctive and colorful traditional dress. This area of Vietnam is well off the beaten track. As you travel through the mountains you can rest assured that the ethnic minorities will be dressed in their costumes not to satisfy the demands of a mass tourist industry, but because of tradition. The southern half of the loop journey passes through the more industrialized hinterland of Hanoi. At this point there are more options for how to return to Lao Cai. 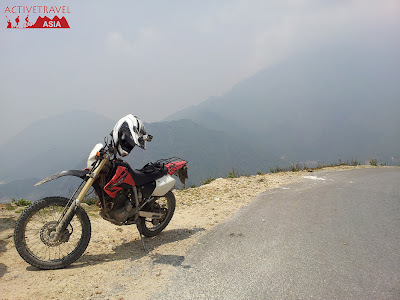 I chose to go north of Hanoi, throw away the map, and navigate by the sun until I met with the northbound route back to Lao Cai. I reached the mountains south of Lao Cai with only minor trouble, getting lost only a few times, and enduring two days of rain. Although there is not much to see in this area, the people are very friendly. I stopped frequently to dry off, warm up and drink coffee with the local people. At one rest stop, the owner of the small cafe served me tea and then ran off to fetch her daughter. The daughter was home on vacation from college in Hanoi, and would practice her English by acting as our interpreter. Initially I was not so sure if her husband felt the same. He later appeared dressed in his old NVA militarily jacket. Giving me a hard stare and a stern look he asked me that if being an American, I was afraid that the Vietnamese would kill me. Through his daughter I told him of course not, and that I considered the Vietnamese to be the nicest people I had ever met. He broke out in a big smile and proudly declared, “very good!” The rest of the family also seemed very pleased by my answer and we had a pleasant afternoon of talking, eating fruit, and waiting for the rain to stop. The entire family rushed out clapping and cheering in disbelief. I assume they had given me up for dead and banked my deposit. That night they fed me, let me take a shower, and arranged my train ticket back to Hanoi. Those two weeks had been amazing, and probably the biggest influence for why I regard Vietnam as my favorite county and I continue to daydream about future trips. For the perfect trip, you should prepare both the physical and mental carefully. To be back home intact, you should follow some rule of Vietnam like riding on the right of road, turn on the signal when turn right or left, move slowly at intersection, school, and hospital. You also can refer adventure tours of trust travel companies to be less risk such as ACTIVETRAVEL ASIA, which have 7 years experience in operating motor biking tour.